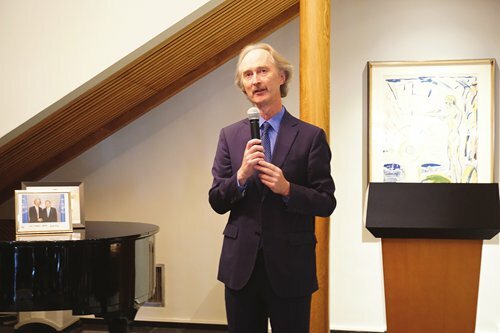 The farewell reception for the Norwegian Ambassador to China Geir O. Pedersen took place at the ambassador's residence on Tuesday. Diplomats, government officials, entrepreneurs, media and friends were invited to the event. The Norwegian Ambassador to China will be leaving his post in China to take on the new role as the UN's Special Envoy for Syria. He was a diplomat at the Norwegian Embassy in Beijing in the 1980s, during which he had the opportunity to meet with Deng Xiaoping on the occasion of the Norwegian presidential visit to China. Within the time of being the Norwegian Ambassador to China from late 2017 to 2018, he has witnessed the honeymoon period of the Sino-Norwegian relations and welcomed the grand delegation from Norway led by the Norwegian King Harald V in October. With sophisticated diplomatic experiences in China, he has a mixed feeling about China. "We love China very much and we admire the Chinese people for what they have been able to achieve. What is so impressive for me is the way China has been able, despite all the progress and all the identified challenges, to address them fairly and move on," he said.